Looking to shoot Rimfire and Pistol Calibers? This is the perfect option for you. Our Standard Lanes are outfitted with the Action Target Touch-N-Go system which is both quick and simple to use. Choose your perfect distance up to 25 yards, hit go, and you're ready to shoot! From wider lanes to the advanced Action Target AWD Pro target carrier, our 25 Yard Tactical Lanes are designed for a premium experience for handguns and rifles. With the ability to turn the target 360 degrees and move up to 12 feet per second, challenge yourself with one of 27 preprogrammed drills or design your own. Looking to get that perfect zero? Shoot in one of our five available 100 Yard Rifle bays outfitted with all the tools you need to dial your rifle in. All rifle calibers from 22LR to 300 Winchester Magnum are allowed. Brush up on your Archery Skills, sight your bow in, or practice for your upcoming hunt in our Archery Range. With up to 30 yards and both traditional targets as well as Rinehart 3D Targets, you'll have a great time! Interested in becoming a member? Just stop by our Range Counter. Whether it's your first time shooting or you're wanting to put a few rounds through a firearm you've had your eye on, we have you covered. Our constantly expanding selection of rental firearms has an option for everyone. Rentals start at $20 an hour plus ammunition. Ally Outdoors is excited to being offering a wide variety of Firearms related courses. The goal of the Ally Outdoors training group is to create an opportunity for any individual to learn and build the essential skills needed to prevail, no matter the mission. For more information on classes, or to schedule a private lesson, swing by the Ally Range Counter. Going to a new Range for the first time can be daunting, but we’re here to answer any questions you might have. If your question isn’t covered here, please use the contact form below so we can quickly address it. GOLDEN RULE: TREAT EVERY FIREARM AS IF IT IS LOADED! Always obey all Firearms Safety Rules. No one under the age of 8 is permitted on the range. 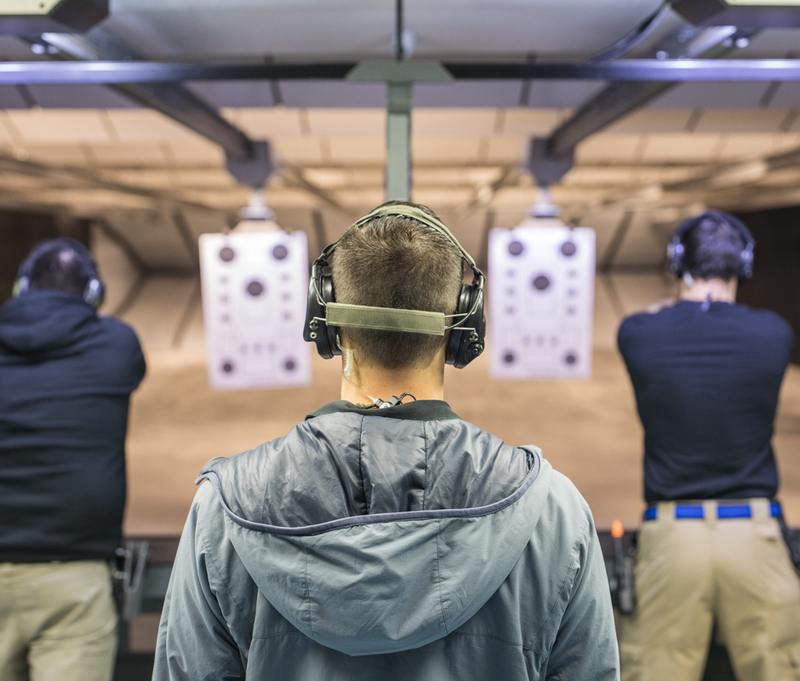 Individuals under the age of 18 must have a waiver signed by a parent or legal guardian, and be accompanied on the range by a responsible adult at all times. All firearms must be transported in a case or bag to and from the range, apart from license holders legally carrying in a holster. Firearms will only be uncased or removed from a holster within the shooting booth area. Load and unload all weapons at the shooting bench. No uncased firearms are permitted behind the shooting booth area. It is your responsibility to know and understand how to operate your firearm safely, ensure your firearm is in good working order, and understand and use its safety features. All Members, Guests and other Ally Outdoors facility users must demonstrate proper knowledge of firearm operation and safety, or they must participate in an Ally Outdoors Firearms Safety Class. Always keep the firearm’s action open, magazines removed, and only load when ready to commence firing. Non-shooters must remain behind the booth area. Always keep firearms pointed down range and in a safe direction. Shoot only the target designated for your shooting lane. Do not transfer uncased firearms from lane to lane. Shotguns, tracers, incendiary, steel-cored, or other penetrating ammunition is not allowed to be used at Ally Outdoors. Subject to approval. All shooting must be conducted in a safe, controlled, and accurate manner. “Dual wielding” is not permitted at any time. Shooters who desire to draw from the holster must be “holster certified” through Ally Outdoors instructors. Upon the command “CEASE FIRE”, stop all shooting immediately, put down your firearm and back away from the firing line. Shooters may not re-approach the firing line or pick up any firearm until a Ally Outdoors Range Safety Officer gives the “all clear” command. Shooting under the influence of alcohol or drugs is strictly prohibited. To minimize lead exposure, food, drink, gum, or any tobacco products are not permitted inside the range. Always remember to wash your hands after you leave the range and prior to eating. I am new and have never even held a gun. Can I go to the range? Absolutely! Our main priority at Ally Outdoors is ensuring that everyone has a comfortable and safe experience. If this is your first time shooting a gun, just inform our Range Employees and we will make sure you’re fully prepared for your first range experience! I don't have any equipment. Do you have ammunition, targets, and other equipment available for purchase? We have everything you need for a successful range trip! From ammunition to targets, we have you covered. Is there a minimum age to use the range? Can I bring my own ammunition to the range? Feel free to bring your own ammunition to Ally Outdoors, with only a few small exceptions. Shotguns, tracers, incendiary, steel-cored, or other penetrating ammunition is not allowed to be used at Ally Outdoors. Ammunition subject to approval. We also stock a wide variety of common range ammunition at extremely low prices. Rental guns can only use Ammo purchased from Ally at the time of rental. How do I know what upcoming classes are available? For the time being, all upcoming classes are posted onto our Facebook Page. Do you allow more than one person in a lane? We allow up to 2 people per lane. 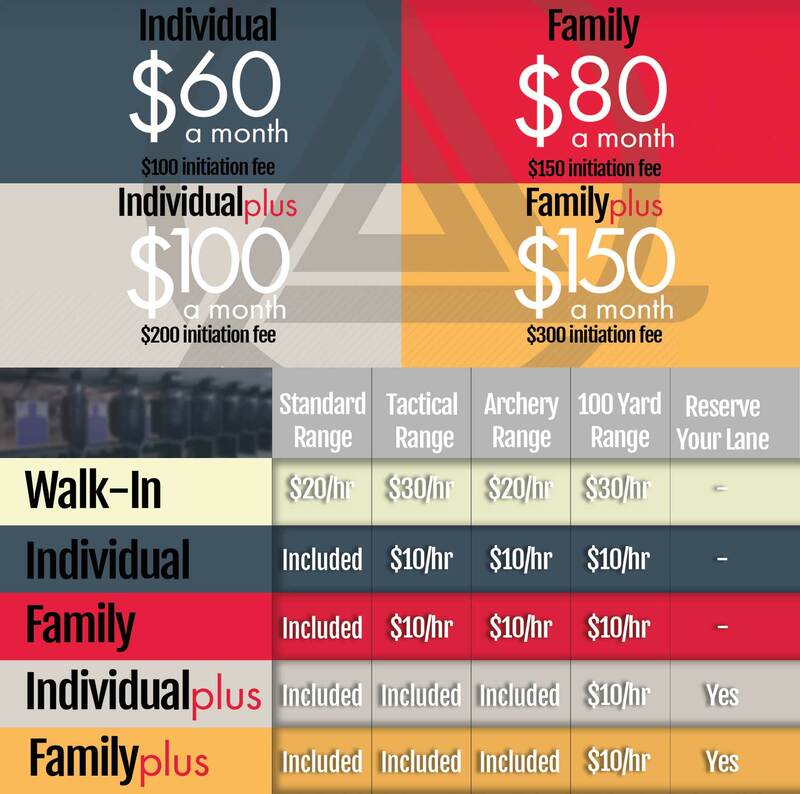 It is a simple $10 guest fee for our Standard 25 Yard Range, and a $15 fee for our 100 Yard and Tactical 25 Yard Range. Can I draw from a holster? This is a simple process in which the shooter demonstrates the ability to safely draw from the holster without flagging themselves or others. Are shotguns allowed on the range? Due to the nature of our Bullet Traps, shotguns are not permitted at Ally Outdoors. Want to stay current on everything going up at Ally Outdoors? Sign up below and we will be sure to keep in touch with exciting announcements! Started by locals, for locals. Our mission is to provide excellent service and a one of a kind experience never before seen in the West Texas region. Interested in becoming a member of Ally Outdoors? Click here for a detailed breakdown of our various membership options.